Hello there! Sorry for my absence, it's the last week of the semester in college and I've just started a new job so life is crazy busy! I thought I'd come back with a post I've been meaning to write since I started this blog. I touched on make up I use in my '5 Minute Make-Up' post but new products have been added and this is more of my everyday fuller make up routine. Starting with the eyes, I use the Urban Decay Naked 2 palette, that my boyfriend very generously bought for me during the summer, everyday without fail. As it has 12 shades it's so versatile and I can use it for a simple neutral look to a dramatic smokey eye. I'm still absolutely in love with Soap & Glory's Super Cat liquid eyeliner pen, it gives amazing precision and lasts all day. I then finish my eyes off with a few coats of Maybelline's Go Extreme mascara which is very volumising and doesn't clump at all. For my eyebrows I've just been using Catrices 'Eyebrow Filler' to comb through them and set them in place. For a more extensive eyebrow routine, checkout my 'All About The Brows' post. During the winter I turn into an actual ghost, comparing my skin to paper doesn't quite explain just how pale I get. As my skin is so pale I mix my holy grail foundation, Rimmel's Wake Me Up foundation, with another of my favourites, Revlon's Colour Stay. I believe I have this foundation in the lightest shade they sell and I mix the two together to create the perfect shade for my skin. Usually I don't bother with concealer but lately I've had terrible dark circles under my eyes so Rimmel's Wake Me Up concealer is a life saver to cover them. I set my foundation with Essence's 'Fix & Matte' translucent loose powder as I like quite a matte finish to my make up and this helps it last all day. Then I give my cheeks a dusting of Natural Collections blush in 'Peach Melba' to give my face some colour. Finally for lips I've been loving the Rimmel Apocalips in Celestial. It's a gorgeous pink that almost matches my blush and it looks really natural. These Apocalips last for ages and don't feel as heavy as some lipsticks might. 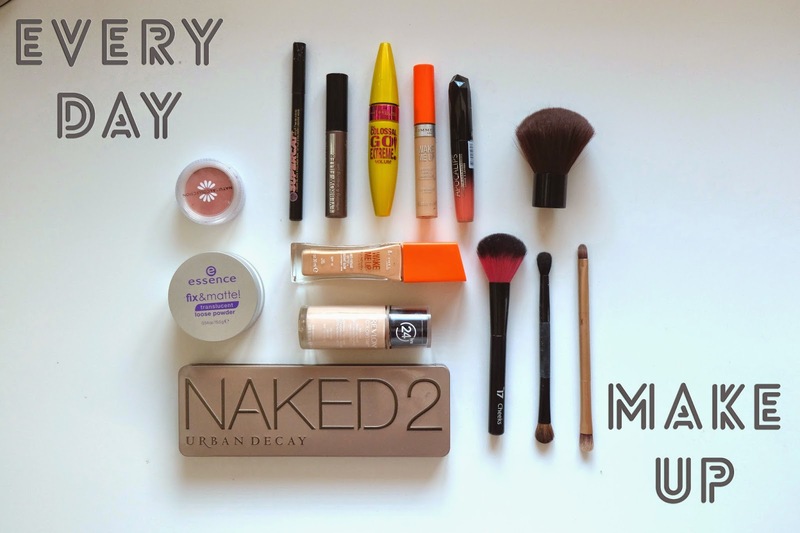 And there we have it, my everyday make-up routine! What make-up items do you use everyday without fail? Let me know in the comments. Hope you enjoyed today's post! Thanks for reading!